(Grapevine, Texas) – More than 450 judo players are expected to compete on Saturday at the Dallas Invitational Judo Championships, a Senior Elite domestic tournament and one of the longest-running events in the United States. The tournament is being held at the Hilton DFW Lakes in Grapevine, 1800 Hwy 26 East, and will begin at 8:30 a.m. with finals being held at 7 p.m.
Juniors 12 and Under … 8:30 a.m.
Juniors 13 – 16 … not before 10 a.m.
Senior Eliminations … not before 12:30 p.m.
Senior Finals … 7:00 p.m.
All three USA Judo National Training Sites (Harlingen, Texas; North Miami, Fla. and the Olympic Training Center in Colorado Springs) will be well-represented at the competition. The OTC squad will include not only top senior players, but also a strong crew of junior players as well as young athletes who will be competing in their first major event through USA Judo’s pilot program with the Police Athletic League. TexSport Publications will publish results from all the matches as soon as they become available. SMU's Petra Klosova and Houston's Anastasia Pozdniakova claimed Swimmer and Diver of the Week honors, respectively, for their showings at the Art Adamson Invitataional hosted by Texas A&M University. The Mustangs finished third in the loaded field, while the Houston divers notched 100 points. East Carolina took seventh in the prestigious Nike Cup, while Marshall claimed second at the Western Kentucky Invite. Rice was also strong at the Indiana Invitational where no team scores were kept. Click on the title of this posting to access complete swimming statistics for the week. Conference USA has eight teams in action Friday night including an undefeted SMU (3-0). The Mustangs are set to host its two-day Hoops For The Cure Classic that features San Jose State, Bradley and Wisconsin-Milwaukee inside Moody Coliseum in Dallas, Texas. Tulsa and UCF will also be in action against top 15 programs in No. 9 LSU and No. 15 Baylor, respectively. Sophomore Andrea Pa'lmai collected wins in the 200-yard backstroke and the 400-yard individual medley to lead the University of Houston swimming and diving team during the second day of the Phill Hansel Duals Weekend at the Campus Recreation & Wellness Center Natatorium. 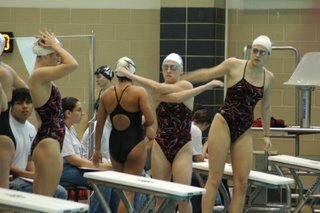 The Cougars rallied on the final day of the 19-event, six-team meet to win four of five dual meets. The Cougars posted wins over Conference USA rival Rice (176-171), Mesa State (297-37), Trinity (281.50-66.50) and New Orleans (262-85) with only a loss to Nevada (203-150). It was the Cougars' first win over Rice since a 147-118 decision to open the dual-meet season on Oct. 16, 1992. With four dual meet wins this weekend, the Cougars also improved to 9-2 overall. That total tied the UH single-season record for dual-meet wins, equaling the mark set by the 2005-06 and the 2003-04 teams. Pa'lmai finished first in the 200-yard backstroke with a time of 2:04.72, more than two seconds ahead of her closest competitor. The Budapest, Hungary, native added a similar finish in the 400-yard individual medley with a clocking of 4:27.57. Senior captain Szintia Szanto finished first in the 200-yard butterfly with a clocking of 2:02.61, nearly a second faster than her closest competitor. The Budapest, Hungary, native also finished second in the 100-yard breaststroke. Sophomore Anastasia Pozdniakova, the reigning C-USA Freshman Diver of the Year, won the 1-meter competition with 336.90 points. The winner of the 3-meter event on Friday, the Elektrostal, Russia, native was the only diver to crack 300 points in either event. Sophomore Sasha Schwendenwein captured first place in the 500-yard freestyle with a time of 4:59.04. The Cougars' 400-yard medley relay team of Pa'lmai, Szanto, Lauren Van Cleave and Jessica Shamburger finished second with a time of 3:55.51. The Cougar Diving team returns to action when they compete at the Art Adamson Invitational next weekend in College Station, Texas. The Swimming team returns to the competitive waters at the Miami (Ohio) Invitational on Nov. 30-Dec. 2 in Oxford, Ohio. The Cougars won't return to the friendly waters of the CRWC Natatorium until Jan. 12-13 when they play host to North Texas, New Mexico State and Florida International in a two-day meet. 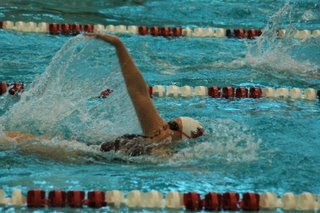 University of Houston swimmer Kristine Kelly swims the 100 yard backstroke during day one of the Phill Hansel Duals Weekend. Sophomore diver Anastasia Pozdniakova and sophomore swimmer Andrea Pa'lmai each posted first-place finishes to lead the University of Houston Swimming and Diving team Friday evening during the first day of the Phill Hansel Duals Weekend at the Campus Recreation & Wellness Center Natatorium. In the six-team, two-day, 19-event meet, the Cougars grabbed big leads over Mesa State (155-21), Trinity (147.50-35.50) and New Orleans (134-49) but were trailing Conference USA rival Rice (93-90) and Nevada (109-77). Pa'lmai captured first place in the 1,0000-yard freestyle with a time of 10:07.44, the fifth-fastest time in school history. Pozdniakova, the defending C-USA Freshman Diver of the Year and the reigning C-USA Diver of the Week, enjoyed a first-place showing with 377.55 points on the 3-meter springboard, more than 80 points ahead of her closest competitor. The meet is named in honor of former UH swimming and diving head coach Phill Hansel. Hansel, considered the Father of Cougar Swimming and Diving, led the Cougars from 1975 to 1996, racking up 70 dual-meet victories, a school record that still stands. Hansel, a 1949 graduate of Purdue, was named the Southwest Conference Coach of the Year three times during his tenure, and mentored 31 swimmers to All-America honors, including Diane Johannigman, the first NCAA swimming national champion in UH history. Hansel also had an impressive resume at the international level, serving as the manager of the 1992 U.S. Olympics teams and working with the Singapore teams at the 1984 and 1988 Olympics. Senior captain Szintia Szanto finished second in the 200-yard breaststroke with a time of 2:17.80 and added a similar finish in the 200-yard individual medley with a clocking of 2:04.53. Sophomore Sasha Schwendenwein finished second in the 200-yard freestyle with a time of 1:51.22, while sophomore Jessica Shamburger earned a second-place finish in the 100-yard backstroke with a time of 57.97. Sophomore Lauren Van Cleave finished third in the 100-yard butterfly. The Cougars' 200-yard medley relay team of Shamburger, Szanto, VanCleave and Schwendenwein started the day with a third-place finish.